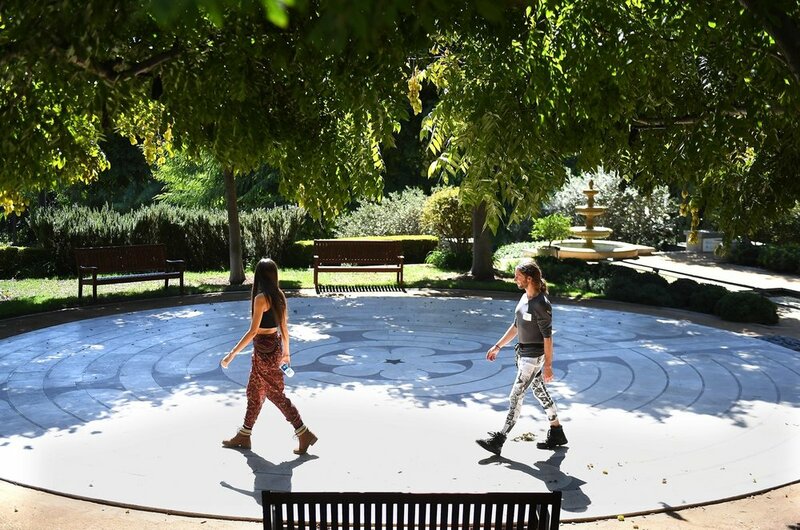 The labyrinth at Peace Awareness Labyrinth & Gardens (PAL&G) was pictured on front page of the Los Angeles Times, October 25, as part of an article about the impact of changing jet patterns in South Los Angeles. PAL&G attended community meetings on the matter and was interviewed by the Times. If you’ve walked the labyrinth here at Peace Awareness Labyrinth & Gardens in the last few months, you’ve been in the presence of "Madame Butterfly," a figurative sculpture that was recently donated by sculptor, Dey Young. This piece feels right at home in the gardens of the Guasti Villa (the former name of this mansion) whose architecture was inspired by Renaissance Italy and that once had a sculpture garden of its own. Just as the marble in this mansion was imported from Italy, so was the stone for Madame Butterfly, which comes from Pietrasanta, which translates to sacred stone. It is Carrara Marble, the same marble that Michelangelo used when carving his most famous sculptures: the David & the Pietá. Dey Young works within the line of sculptors who has sought the angel in the marble and carved to set it free. The discovery of Madame Butterfly began in California when Dey created a maquette of the sculpture to practice her theme. She captured the female form in movement, resting between figuration and abstraction. A crescent moon, full hips and breasts, flowing draperies. Next Dey traveled to Italy in search of the perfect block of statuary marble, the one from which Madame Butterfly would emerge. She worked with artisans for three months before returning to her studio in California where she carved and polished for another nine to complete the sculpture. As we stand before Madame Butterfly, I picture what the initial block of marble might have looked like, 2500 pounds of solid stone, holding the angel within. It is no mistake that this process of carving marble has been used as a metaphor for spiritual awakening. As we talk to Dey about her work, I am transported. I picture the confident touch of Dey’s hands and tools, working to free this butterfly from its chrysalis of stone. I remember visiting Dey in her studio. Remember the rough blocks of different colored stone waiting for their turn to be carved. Some of them marked with crayon, hinting at the figure within. Heavy and peaceful, filled with potential. I remember the peace that was present in the studio as Dey carved a figure in alabaster. With her loving attention on the stone, everything else faded into the background. I think of Madame Butterfly’s journey. I think of her traveling from Italy to Dey’s studio in California, then to a gallery in New Mexico, and finally resting in the Gardens of Prana. Dey shares about her journey as an artist, about the way that sculpture has been a teacher in her life. She tells us about her other teachers, John-Roger and John Morton and tears of gratitude come to her eyes. As the sculpture has found its home, so has she. We invite you to visit to see the sculpture for yourself. Click the button below to sign up for a tour today. In the meantime, keep seeking the angel in the stone. God bless you. David Whitaker with Video by Lucia Doynel.